This Lima bean recipe is an old fashioned southern favorite. Like most other legumes the Lima bean is high in dietary fiber and is thought to be lower cholesterol. What I find most appealing about Lima beans and beans in general is that if combined with whole grain rice, beans become an excellent source of high quality protein. In fact, you can have meatless dinners containing beans and rice and still get the recommended daily allowance of protein. Yes you heard correctly, you can forgo eating meat if you consume adequate amounts of whole grain rice and beans. Most people are familiar with Lima beans that are cream color or green. However there are several varieties of Lima beans other than the traditionally colored cream and green. If available give the other colors of black, brown, purple, red and white a try. Just in case you don't already know, Lima beans are also sometimes referred to as butter beans. I'm sure you'll enjoy the Lima bean recipe that follows. Sort beans on kitchen counter top or on a plate. While sorting discard beans that are damaged, rotten or discolored and remove any stones or debris. After sorting place beans in strainer, place under running cold water and rinse thoroughly. Beans must be presoaked to shorten the cooking time and make the beans more digestible by helping to reduce the effects of gas. Place beans into a pot or bowl and cover with at least two inches of water. Soak overnight in the refrigerator for at least eight hours, changing the water two or three times before cooking. Just before cooking drain the soaking water from the beans and rinse one final time with fresh cold water. Place rinsed beans into pot or saucepan with lid and add two to three cups of water for each cup of dried beans. In this case 1 pound of dried beans equals about two cups. So you would add 4-6 cups of water to the pot containing your lima beans. Next add onions and brown sugar to pot and partially cover pot with lid. Bring water to a boil, reduce heat to a simmer and cook beans until tender. When beans become tender, add salt and pepper to beans and cook for an additionally 5 minutes. Beans are now ready to eat. 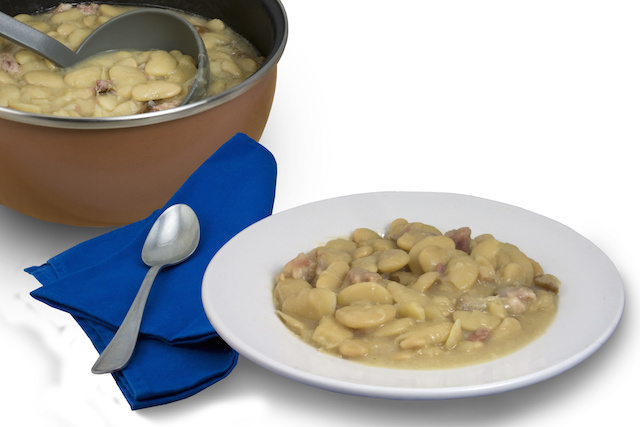 For additional flavor you can add the meat from a cooked ham hock to your beans just before the cooking begins. Without the ham hock, this recipe is a very healthy choice for people with diabetes. However check with your nutritionist to see if lima beans are right for your diet.